In 219 B.C.E. the Carthaginian general, Hannibal, confronted a daunting task. 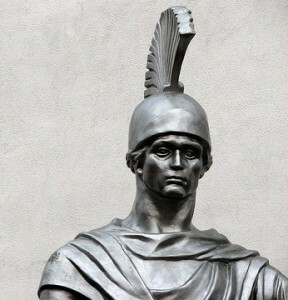 He had been ordered to lead his army into Italy to attack Rome. The only way to achieve surprise and do so quickly was to cross the Alps. No army had done that before. His subordinates argued against it. It was impossible. It had never been done before. His army was too small to defeat the Romans, even if they did survive. Hannibal was undeterred. He knew that he would surely fail if he hesitated. He knew, even if he didn’t know how to move, that he had to move! Knowing this, his orders were simple and direct. “We will find a way, or we will make one.” He successfully crossed the Alps, and defeated one Roman army after another sent against him. The strange things is, we can change our brain, even as adults…and…when we do…we can change our world. More and more scientific studies confirm that our brains remain open to change throughout our entire life, and well into our adult life span. Known as “neuroplasticity” our brains continue to change in response to things we can influence or effect. Studies show the neural circuitry of our brains change and adapt, creating new neural patterns, in response to the thoughts we think, the people we are in relationship with, and what we focus our attention on. Meditation, mindfulness practices, and developing the skills of self observation and emotional awareness one can learn in counseling, all can help us to literally “rewire” our brains. Much as it was with Hannibal, it is belief that often controls what we will do….what we will dare. Change happens when we believe in the possibility of change and then, most importantly, take the actions to bring it about. So we have to embark on our sometimes frightening journey of growth as did Hannibal, with a trust and a belief that, come what may, we are all always capable of finding a way… or making one!